Stitchboard Community - Help! New to this and trying to make my first graph! community home > Free Pattern Wizard > Discussion > Help! New to this and trying to make my first graph! Help! New to this and trying to make my first graph! Re: Help! New to this and trying to make my first graph! What you're seeing is what can happen when you're trying to change the size of your image through the freePatternWizard, though there are other reasons it can happen, too. For instance, if you're trying to go from something much larger down to a much smaller size, you won't get optimal results. It also depends on the format of your original. If you're going from a jpg, that can give you less optimal results. A jpg isn't a great image to begin with (gifs or pngs are better formats); however, that said, if you go from a jpg to a gif or png, that won't alleviate the problem, because if it's already been in a jpg format, you'll get the same smudgy file you started with! I can't talk about how they work, as I use an ancient version of Paint Shop Pro, but this is the best way to accomplish file manipulation, through a program that will help you optimize the image. It works best if you can go from an original that's pretty much pixel to pixel, e.g., a 300 x 300 image to a 300 x 300 graph. But if your image is way larger or way smaller, that's not going to give you your best reslults. Hope this helps...if you can give a little more info about the kind of image you're using and the file format, we can attempt to pinpoint what's going on. The stray pixel cleanup can only go so far, so remember that if your image has other problems, you won't get a good result even with the stray pixel cleanup option checked. Have tried those formats and haven't had much luck. There are lots of stray pixels. How do u get rid of them? I tried a lot of stuff. Worked on it for a couple hours. I still couldn't get the extra pixels to go away. Tried different image formats, image sizes, even different images, changed settings, etc. Nothing got it to look perfect. I also want to know if there is a way to manually get rid of them? At this time we don't have editing capabilities available for the freePatternWizard. What format was your original picture in and how did you get it into gif and png formats? If you copied from jpg into gif or png, you would still be bound by the limits of the jpg format. You can't simply copy to a non-jpg format from jpg, as the damage has already been done. The other thing is that if it's still not working, we can have you send the original by email, and we can see if there's anything about the image that may not work. In that case, if you let us know here, we'll send an email from an address that you can send to, so we can see if there's something that can be done with the image as far as a pattern. I tried two different images. One was a gif and one was a JPG. The JPG was converted using Adobe Photoshop. My sister is a graphic designer so was able to do the change and save it in that format. We even tried changing the size of the image to the amount of stitches I wanted. 60 pixels = 60 stitches which using C2C would equal 60". I can send you the image if you are willing to try. I'm looking to build a blanket that fits a twin size bed so if you have any suggestions for sizing that would be helpful too. The problem with jpgs converted to gifs is even if the conversion is done in a great package like Photoshop, it doesn't mean the colors won't end up blotchy and smudged, unfortunately. The jpg format isn't really a good or optimal one. Imagine if someone gives you a photo, and it's blurry. So say you scan it in to work with it on the computer. It's still going to be a blurry photo. That's what it's like with jpgs changed to gifs. That's why it doesn't work, because jpgs are blotchy and smudgy, just like that photo is blurry. If you look closely at spots that are supposed to be all one color in a jpg, you'll be surprised to find those areas have many different colors, not just one constant color. That's why you can't simply change your format from jpg to gif, because you still won't have solid areas of one color. You will simply end up with the gif format in many (and often wrong) colors instead of constant colors as would be optimal. That's also why the stray pixel cleanup isn't doing what you'd like. Part of that image has blotchy colors caused by either directly using a jpg with its blotchy colors instead of solid ones, or making the format gif when it was once jpg, thereby transferring the blotchy colors into gif form and giving terrible results. They look pretty identical, don't they? In the first picture, you can just barely see the eye dropper is selected on the left (the thing that looks like a medicine dropper). Let's see what happens when we compare two spots in the lighter pink on the same image. So in the above picture of the gif as sampled twice, you can see the eye dropper tool, the "+" in dotted lines in both samples. Those two spots look pretty near each other, don't you think? Now look at the numbers on the right, showing the comparison of the RGB values in the first and second sampling. All I had to go was a fraction of an inch away from the first sampling with the eye dropper, and already, though the colors look identical to our human eyes, they're different enough to create different colors that the program can't tell is supposed to make the same color all the way through. Even a small change from blue 127 to 123 is still not going to look like the same color to the freePatternWizard. Another question...are you trying to generate a C2C pattern? Because we don't have a C2C function. The program generates patterns in single crochet or Tunisian crochet. As for a twin size bed, you can look for industry standard measurements; however, the only measurement you have control over in the freePatternWizard is the width. The freePatternWizard won't give control over the vertical size because it's made to optimize the dimensions of your image so it doesn't skew. If you're sending it something 60 stitches wide and designate it as such, depending on your design, it could turn out shorter than you'd like or longer than you'd like. 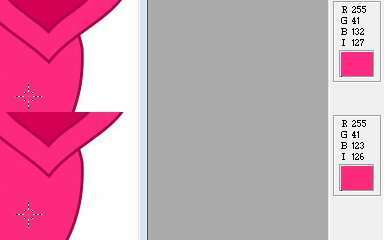 If you could change the length of the image in the freePatternWizard, that wouldn't work, as your image would distort. You can add borders, though...if you fiddle with the finished size and borders in a graphics program, you can make your design near the right size vertically. Another thing to keep in mind is your gauge. That's key in knowing if your finished design will be the size you want lengthwise as well as widthwise. That factor will depend on your yarn weight, hook size and tension, which also depend on how loose or tight you crochet. I know this is a lot of information to throw at you all at once and I apologize, but I wanted you to really see through the eyes of the freePatternWizard, so to speak, to understand that if you change a jpg to a gif in the most technologically advanced software, you're still not going to get the results you want, because the program will still change the colors as it sees them, not as you want them, and in a jpg it's not going to see all shades as the exact same color all over. Finally, I'll send you an email so you can send me the file you're attempting to use. Please send the original file, so if it's a jpg, send the jpg.